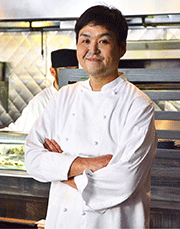 A native of Yokohama, Japan, Chef Takahiro was raised in a family with deep food traditions. Helping his family grow rice, make seasonal tsukemono pickles, and miso paste, he learned about the importance of ingredients and techniques, but most of all, he learned about the magic of taste. His first job was at the famous Motomachi Bairin restaurant in Yokohama, said to be famed director Akira Kurosawa's favorite restaurant. Here, he was awakened not only to the best seasonal ingredients from all over Japan, but from all over the world. It was at this time Chef started thinking about a career in food, and a mythical place called California where there was amazing produce year-round, a new culinary movement, and awesome surfing. Chef set his sights on Los Angeles. Chef arrived in Los Angeles in the fall of 1991 and immediately found work at the now-closed but well-loved Sawtelle Kitchen, a pioneer in Japanese-French cuisine. Under the encouragement of Maison Akira's Chef Akira Hirose, Chef Takahiro spent the next decade cooking at some of the finest restaurants in Los Angeles: JiRaffe Restaurant with Chef Raphael Lunetta, the legendary L'Orangerie under Chef Christophe Eme, and Lucques Restaurant with Chef Suzanne Goin. In 2004, Chef Takahiro joined the opening team for Mix, the much-anticipated French-Californian restaurant from restaurateur Michael Bourseau and Chef John Jackson in West Hollywood. Though critically-acclaimed, Mix closed unexpectedly and for the first time, Chef found himself out of work. Later that same day, he learned was going to be a new father! Out of work and with a baby on the way, Chef Takahiro decided it was time to put down some roots and secured a position working alongside Master Chef Nobu Matsuhisa at his flagship Beverly Hills restaurant Matsuhisa. Over the next nine years, Chef Takahiro rose to the position of Pastry Chef and Kitchen Chef of Matsuhisa, contributing many memorable recipes that are still popular today. Today, Chef Takahiro's dream is to bring his style of food—featuring the best local and seasonal ingredients using Japanese and French techniques—to a wider audience. When not in the kitchen, Chef Takahiro enjoys exploring Southern California with his wife and year-old daughter.